welcome to over 9,700 files of information on The Beatles and Paul McCartney! reviews of over 1640 discs - CDs and LPs - with track details, scans. Various indices, literature, related articles and background information. There is nothing like it elsewhere on the net! a comprehensive news archive containing way over 500 teletext articles, most of them translated into English. Various other interesting articles. 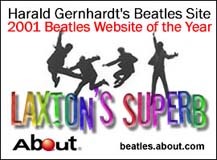 www.gernhardt.com | www.mcbeatle.de The Rutles are back! straight from the parallel universe..
© 1994-2018 Harald Gernhardt. All rights reserved. "PLUGGED" and "The Beatles" logos ©1996,97 Harald Gernhardt. The use of these logos on other sites is prohibited. This site is not related to "The Beatles™", "Apple™", "MPL Commuincations Ltd./Inc. ", "EMI" or related companies. This site is provided for informational and educational purposes only! All other images are (c) copyright their respective owners!